Except UV finish,oiled fiish is becoming even more popular by consumers in consideration of its unique Eco - friendliness.The oil coating is usually applied on real wood surface only like engineered wood flooring or various hardwood flooring surfaces. 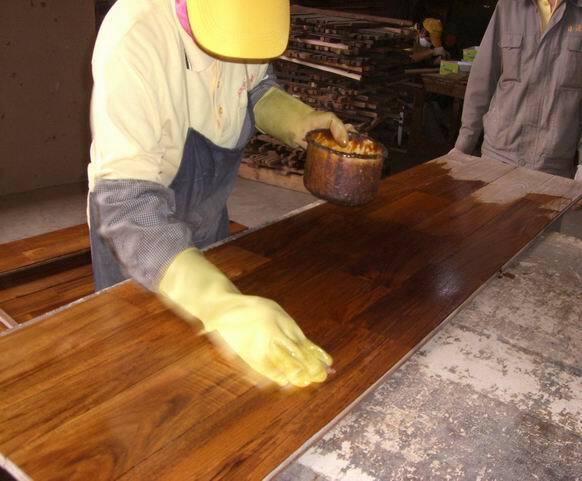 What is wood oil coating? As the best substitute of traditional Synthetic Chemical UV cure polyurethan coating ,the new coating contents are mainly come from plant extracted natural oil,it is 100% harmless to peoples health.It is also called wood wax oil. The main compositions of wood wax oil are from refined linseed oil ,palm wax etc natural botanical wax or oiles,even the dyed color pigment content can be edible.Therefore the coating is totally free of Triphenyl,Formaldehyde,as well as heavy metal contents and other toxic compositions.No irritative smell can be detected from this oil finish. Wax oil coating shoud be applied along the real wood grain direction from a first thin layer and after 4-8 hours drying time apply the second oil layer on the wood flooring surface.In the second step,workers should sand the floor board surface untild the timber floor exhit some matt gloss.20-24 hour later,the wood wax oil finish will be completely dried.The finished wood fiber micro-structure is enabled to breath naturally,no thick block layer on the surace,therefore no crack,peel off or warp appear on the wood board with such wax oil coating.